The 2015 President’s Budget proposes major new investments to build the health care workforce and improve the delivery of health care services, particularly primary care services, across the nation. This report describes its key components: a new Health Resources and Services Administration grant program geared toward modernizing graduate medical education, major expansion of the National Health Service Corps and extending enhanced Medicaid primary care payments through calendar year 2015. The report describes how these proposed investments build upon Department efforts, including those funded through the American Recovery and Reinvestment Act and the Affordable Care Act. The 2015 President’s Budget proposes major new investments to build the health care workforce and improve the delivery of health care services, particularly primary care services, across the nation. · Modernizing Graduate Medical Education: Create an updated approach to residency training by targeting $5.23 billion in mandatory funds to an innovative competitive grant program to create new residency slots with a focus on community-based ambulatory care. This program will be administered by the Health Resources and Services Administration (HRSA). It is expected to produce 13,000 physicians over the next ten years and advance key workforce goals, including the training of more physicians in primary care and other high need specialties, aligning training with more efficient and effective care delivery models, and encouraging physicians to practice in underserved areas including rural areas. · National Health Service Corps (NHSC): Expand the Corps to increase the availability of providers in those areas across the country most in need. Over the next 6 years, the Department will devote $3.95 billion in mandatory funds to the NHSC which will greatly expand the number of NHSC health care providers in underserved areas from fewer than 8,900 to an annual field strength of 15,000 for each year from 2015 through 2020. · Extend Enhanced Medicaid Primary Care Payments: Extend the Affordable Care Act’s (ACA’s) enhanced Medicaid primary care payments through Calendar Year (CY) 2015 to better target primary care and expand eligibility to mid-level providers practicing independently, at an estimated cost of $5.44 billion. The ACA requires Medicaid reimbursement for primary care services furnished by eligible physicians to be increased to the Medicare rates for CYs 2013 and 2014. This initiative builds on the Administration’s continuing efforts using a variety of policy tools across agencies within the Department of Health and Human Services to help assure that the nation’s health care workforce can meet the challenges of 21st century health care delivery. Investments from the American Recovery and Reinvestment Act of 2009 (ARRA) and the ACA have helped lay the ground work for this workforce initiative, and they, in turn, are built upon both long-standing and evolving workforce development efforts across the Department, particularly in the Centers for Medicare & Medicaid Services (CMS) and HRSA. The President’s budget proposals seek to increase the number of providers trained and better match the supply and distribution of well-trained health care personnel to meet the needs of the nation’s evolving health care delivery system. Much of the Department’s focus has been on expanding access to primary care services. A number of factors influence the contemporary health care workforce’s ability to meet emerging demands. Among these factors are population growth, the aging of the population, the growing burden of chronic diseases across all age groups, the adoption of new technologies in medical practice, the anticipated retirement of baby boom health care practitioners, and the expansion of insurance coverage to millions of Americans through the ACA. These factors play out against an existing workforce that is maldistributed geographically and across specialties and is sometimes in short supply. The Department proposes to meet these challenges with a multi-pronged policy agenda that promotes the effective delivery of high quality care while constraining costs. The Department has long promoted a health care workforce that provides high quality, cost- effective, culturally competent care; possesses the skills and tools necessary for delivering that care; and sees innovative delivery system reform as a means to improve care delivery for patients. 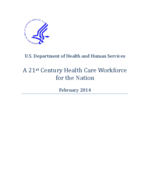 This report highlights the Department’s 2015 workforce budget proposals as well as certain other efforts to make full use of each member of the health care team, better align the health workforce to population needs, promote skills and tools for delivering high quality care, and through existing policy levers use the health workforce to transform health care delivery. It is not intended to be an exhaustive list of the workforce accomplishments of ARRA and the ACA, which have been summarized in other documents. The American health care workforce includes more than 14 million people, and accounts for about 10 percent of the national workforce. This total includes those employed within the health sector, in hospitals, clinics, practitioners’ offices and nursing homes, as well as those employed in other sites such as insurance companies, worksites, schools, and government at all levels. The workforce job classifications encompass a rich mix of occupation types and professional qualifications. The largest numbers by category are found in registered nurses (2.8 million), nursing, psychiatric and home health aides (2.3 million), personal care aides (1 million), physicians (861,000), medical assistants and other health care support personnel (845,000) and licensed practical and licensed vocational nurses (690,000). This paper focuses on clinical care health professionals, and in particular those providing or supporting primary care, including the nearly 300,000 physicians, nurse practitioners, and physician assistants and their support staff who collectively provide the integrated, accessible, first contact health care that addresses a majority of most individuals’ health care needs. It does not specifically address the long term care work force and direct care workers although some of this paper’s themes are applicable to this group as well. In addition to the work of the National Center, enhancements to the National Center for Health Statistics’ National Ambulatory Medical Care Survey over the past several years shed valuable light on the current practice of ambulatory medicine on topics such as the use of electronic health records by office-based physicians. Commentators have said that the way Medicare and many other health care purchasers pay for physician services undervalues primary care and other medical care that is not procedure-focused. That can lead to medical students choosing specialty care over primary care in part because of better lifetime earnings. In the past Medicare has offered incentive add-ons to its normal payments to influence practitioner behavior. One long-standing example is the Health Professional Shortage Area (HPSA) incentive payment whereby physicians who furnish Medicare-covered services within a geographic HPSA are paid a 10 percent bonus above what they would have otherwise been paid. The ACA builds on this model by -- for the years 2011 through 2015 -- providing a 10 percent incentive payment, the Primary Care Incentive Payment (PCIP), on top of the fee schedule payment for select primary care services. To qualify for the bonus, physicians must be self-designated in a primary care specialty (general internal medicine, family practice, pediatrics, and geriatrics) and a substantial portion—at least 60 percent—of their Medicare billings must be for designated primary care services. Of particular note, unlike the HPSA incentive payment, this payment is also extended to nurse practitioners and physician assistants. The Department has announced its intention to begin paying, in January 2015, for chronic care management services for beneficiaries with complex needs. These services must be provided by practices meeting standards necessary to furnish high quality, comprehensive, and safe chronic care management services. It is expected that this will encourage coordination across provider types and locations and encourage non-face-to-face patient contact through, for example, telephone or internet encounters. The ACA also contained a provision that required Medicaid to reimburse primary care services provided by eligible physicians at no less than Medicare rates during calendar years 2013 and 2014. While Medicaid physician payment on average was approximately 65 percent that of Medicare, primary care payment lagged further at only 59 percent of Medicare rates. This provision in the President’s budget will help expand access for Medicaid patients as many States expand their Medicaid programs. Its longer duration will help influence physician behavior and extending the provision to independently practicing nurse practitioners and physician assistants will expand the number of eligible providers. Enhanced Medicaid Primary Care Payments: The President’s 2015 budget request broadens eligibility for this increased payment to mid-level providers, better targets primary care, and extends the program for an additional year. Medicare is improving the way it pays for physician services. The Center for Medicare and Medicaid Innovation (Innovation Center) is exploring new payment models and service delivery models, including some models that are testing movement away from payment based solely on the number of procedures or services delivered to patients and towards models that reward high quality, patient-centered care. Established through the ACA, with $10 billion in funding for FYs 2011-2019, the Innovation Center is charged with testing innovative payment and service delivery models designed to maintain or improve the quality of care furnished to Medicare, Medicaid, and Children’s Health Insurance Program beneficiaries and reduce program expenditures. The ACA permits expansion, including implementation on a nationwide basis of the duration and scope of the model tested by the Innovation Center. Models may be expanded if the expansion is expected to reduce spending without reducing the quality of care or improve the quality of care without increasing spending. The Chief Actuary of the CMS must certify that contemplated expansions not increase net spending. Currently 18 major service delivery and payment models are being tested. Innovation Center demonstrations are discussed in more detail later in this paper. The Medicare program supports graduate medical education (GME) through a system of two payments to teaching hospitals. Direct Medical Education (DME) payments take the form of Medicare paying its share of a hospital’s per resident costs from a base year and trended forward. The number of residents supported in this way by Medicare has been capped since 1997. Teaching hospitals also receive Indirect Medical Education (IME) payments through an adjustment to the diagnosis-related group payment for each Medicare covered in-patient stay to take into account the higher costs of teaching hospitals. Together these two types of payments are projected to total $11.2 billion in 2014, approximately $3.3 billion for DME and $7.9 billion for IME. (Most states also make GME payments through their Medicaid programs. As of 2012, 42 states and the District of Columbia made GME payments through their Medicaid programs, with an estimated total Medicaid spending of $3.87 billion.) Observers have noted that GME slots and spending are not evenly distributed, with large differences across the states in the number of residents supported, and per capita GME spending, with an imbalance not attuned to those states now growing in population. The location of the residency is a strong predictor of where a physician ultimately practices. The ACA required the redistribution of unused GME slots, with 70 percent of redistributed slots allocated to those states whose resident-to- population ratios were in the lowest quartile. In assessing graduate medical education in a 2010 report, the Medicare Payment Advisory Commission (MedPAC) found that these current funding mechanisms are not optimally aligned to produce the medical workforce needed in the future, highlighting increased specialization and limited racial and socioeconomic diversity among residents. MedPAC also noted that IME payments were significantly in excess of hospital costs associated with medical education and suggested pairing a reduction in funding for IME with increased support for high quality primary care training. As in the past two years and again this year, the President’s budget is proposing reducing by 10 percent IME payments and better aligning these payments with Department priorities. This proposal would give the Secretary authority to set standards for teaching hospitals receiving GME payments to encourage the training of primary care residents and an emphasis on skills that promote high-quality and high-value health care delivery. A new HRSA grant program, Targeted Support for Graduate Medical Education, proposed in the 2015 budget request, builds on the ACA GME provisions and is an important first step in better shaping graduate medical education to align with national needs. This grant program will be funded through transfers from the Medicare Hospital Insurance (HI) Trust Fund and is a way of encouraging innovation in training models and greater accountability in the use of GME funds. The program would support new residency slots in primary care or other high need specialties, not supported by GME payments, in teaching hospitals and other community-based health care facilities with a focus on ambulatory and preventive care, value, and reducing health system costs over the long-term. Funds will be targeted to training programs that feature concepts such as team-based care, the effective incorporation of health information technology into clinical practice, population health, and telemedicine. Special consideration will be given to rural areas. It is expected that this program will produce 13,000 physicians over the next ten years. Two current HRSA programs will be supported by this new mandatory funding: the Children’s Hospital Graduate Medical Education Program and the Teaching Health Center Program. Modernizing Graduate Medical Education: The new HRSA grant program, Targeted Support for Graduate Medical Education, proposed in the 2015 budget request, builds on the ACA GME provisions, will train 13,000 new residents in primary care and high need specialties, and is an important first step in better shaping graduate medical education to align with national needs. This program will expand the reach of other HRSA workforce training programs funded by Titles VII and VIII of the Public Health Service Act. These programs represent what have been the Department’s largest discretionary investments in workforce training. Several of these programs received funding from ARRA. Many of these programs were reauthorized by the ACA and additional funding was provided in 2010 with funding from the ACA’s Prevention and Public Health Fund. Awards were made in 2010 for a five year initiative, with new support for training primary care residents ($198 million), nurse practitioners ($31 million), and physician assistants ($30 million). These investments are training 1,700 new primary care providers. Additional awards were made in 2012 for a three-year initiative to train 200 additional mental and behavioral health practitioners. Key to the Department’s efforts to address the uneven distribution of health care professionals across the nation is the National Health Service Corps (NHSC). Founded in 1972, the NHSC is the Department’s largest program of obligated scholarships and loans. The NHSC has provided scholarships and loan repayment to physicians, advanced practice nurses, physician assistants, dentists and certain other providers, including behavioral health providers, in return for practice in a designated HPSA. The American Recovery and Reinvestment Act revitalized the NHSC through a $300 million short-term infusion in 2009 through 2011. This funding was more than double the NHSC’s appropriation for 2009. The ACA built on this base, providing approximately $1.5 billion for 2011 through 2015 for the NHSC. Enhanced funding for the NHSC allowed its field strength to more than double from 3,600 in 2008 to nearly 8,900 by the end of Fiscal Year 2013. These providers are currently caring for approximately 9.3 million people in all 50 states. Roughly half of all NHSC providers meet their service obligation at federally-funded health centers. About 45 percent of all NHSC providers serve in rural sites; in 26 states there are more rural NHSC providers than urban. A pilot program, begun in 2011, expands eligibility for NHSC providers to Critical Access Hospitals affiliated with an outpatient ambulatory clinic. Retention in the NHSC is high. Approximately 85 percent of NHSC participants continue to provide care to the underserved up to two years after their obligation is completed while 55 percent continue to provide care to the underserved ten years after having completed their obligations; the default rate is less than 1 percent. The need for NHSC providers remains high across the country with demand exceeding current funding levels. Funding priority is given to clinicians working at NHSC sites in communities designated as high need. The Department’s decision to seek substantial new funding for the NHSC is built on the longstanding needs of underserved rural and inner city areas, the NHSC’s proven retention record, and continued demands for primary and other health care services. National Health Service Corps: The President’s budget proposes a sustained level of commitment to the NHSC through 2020 totaling $3.95 billion. The President’s proposal will allow the program to grow to support 15,000 providers per year and also give the Secretary the flexibility to expand NHSC eligibility to other high-need disciplines and service sites on a temporary basis. Key components of ARRA laid some of the groundwork for improving the efficiency and quality of health care delivery. One of its components was the Health Information Technology for Economic and Clinical Health (HITECH) Act, a part of ARRA, which set forth an ambitious program for building health information technology (HIT) into the delivery system. The interconnected employment of incentives and penalties related to meaningful use of electronic health records (EHRs) is intended to make care delivery more efficient and to give providers new tools to improve both individual and population health. This has resulted in a rapid increase in adoption of HIT, with more than 60 percent of eligible physicians (and other professionals) and 85 percent of eligible hospitals receiving incentive payments for adopting and using EHRs. Health centers, funded by HRSA, are playing a critical role in system redesign because they provide accessible and dependable sources of primary care services in underserved communities. The ACA established the Community Health Center Fund that is providing $11 billion over five years for the operation, expansion, and construction of health centers across the country. The nation’s 1,200 health centers operate 9,200 delivery sites and, in 2012, provided care to 21.1 million people. Health centers emphasize coordinated primary and preventive services for low‐income individuals, racial and ethnic minorities, rural communities, and other underserved populations. They place emphasis on the coordination and comprehensiveness of care, the ability to manage patients with multiple health care needs, and the use of key quality improvement practices, including health information technology. The health center model also embraces a team‐based approach to care that includes physicians, nurse practitioners, physician assistants, nurses, dental providers, midwives, behavioral health care providers, social workers, health educators, and many others. Team-based models allow providers to leverage the knowledge and skills of all team members, including allowing those with higher levels of training to focus on more complex cases and all to practice to the full extent of their licenses. In November 2010, HRSA established a patient-centered medical home initiative to promote more effective and efficient care in health centers. To date, more than 40 percent of health centers have been recognized. Health centers also reduce costs to health systems; the health center model of care has been shown to reduce the use of costlier providers of care, such as emergency departments and hospitals. But perhaps the greatest promise for health system redesign comes through the previously discussed service delivery and payment reform models of the Innovation Center. Established by the ACA, the Innovation Center is funding a growing portfolio of project models all directed at improving care delivery and/or reducing costs. Models that reduce spending without reducing the quality of care or improve the quality of care without increasing costs can be expanded and disseminated so that best practices can be adopted more broadly. Virtually every Innovation Center demonstration has workforce implications: For example: the Innovation Center, in partnership with HRSA and building on HRSA efforts, has engaged 473 Federally Qualified Health Center (FQHC) sites to participate in a FQHC Advanced Primary Care Demonstration to test the effectiveness of doctors and other health professionals working in teams to coordinate and improve care for Medicare patients. Participating FQHCs are expected to achieve Level 3 patient-centered medical home recognition, help patients manage chronic conditions, as well as actively coordinate care for patients. However, one set of Innovation Center projects has particular workforce relevance. In 2012, about $1 billion was awarded to 107 grantees across the country in the first round of Health Care Innovation Awards. These projects needed to address the Innovation Center’s broad themes of better, more cost effective care, but in addition applicants were required to address workforce implications of their projects. Awarded projects varied in design. Many proposed new staffing arrangements. Primary care proposals frequently emphasized the medical team and expanded use of employees such as community health workers. A second round of applications is under review. The Department is confident that it can learn from these projects to further inform how care should be delivered, how it should be paid for, how medical teams can function more effectively, the skill sets providers need today and in the future, and how the Department can deploy its resources more effectively in its workforce training programs. The Administration, led by the Department, has been focused on ensuring that the nation’s health care workforce is properly prepared and deployed to meet the needs of the 21st century. The Department has developed a workforce vision that is guided by the principles that we must move toward a value-based delivery system, improve access to primary care, make full use of every member of the health team, align workforce to population needs, and use workforce levers to transform health care delivery. The Department has a number of available policy levers. By using these, developing and employing appropriate performance measures, and working through its agencies, it can continue to focus on creating and supporting a cadre of highly trained health care providers who are well-distributed and prepared to serve in an evolving health care delivery system. The new proposals in the President’s FY 2015 budget are a major step in advancing these objectives. In geographic HPSAs, PCIP qualifying physicians receive both bonuses. Because Medicare GME is tied to Medicare payment, payments to pediatric teaching hospitals historically were limited. To address this point, in 1999, Congress enacted the Children’s Hospital GME program. This program provides a payment to free standing children’s hospitals that is modeled after Medicare’s direct and indirect GME payments. Currently about 55 children’s hospitals receive these payments. The 2014 appropriation is $265 million. In order to encourage primary care training in community settings, the ACA established the Teaching Health Center GME program, operated by HRSA, to give opportunities for residency training in the ambulatory settings in which primary care physicians and dentists practice. Funded with up to $230 million, to date more than 40 residency programs are providing training for nearly 350 residents. Close to half the training sites are located in medically underserved communities and/or health professions shortage areas. ARRA provided $200 million for HRSA’s Title VII and Title VIII workforce programs. There are also similar loan and scholarship programs directed at Native Americans and Native Hawaiians. A recent NHSC focus has been increasing placements at Indian Health Service and tribal sites.